Opera Touch is now available for iOS users following its launch on Android earlier this year. 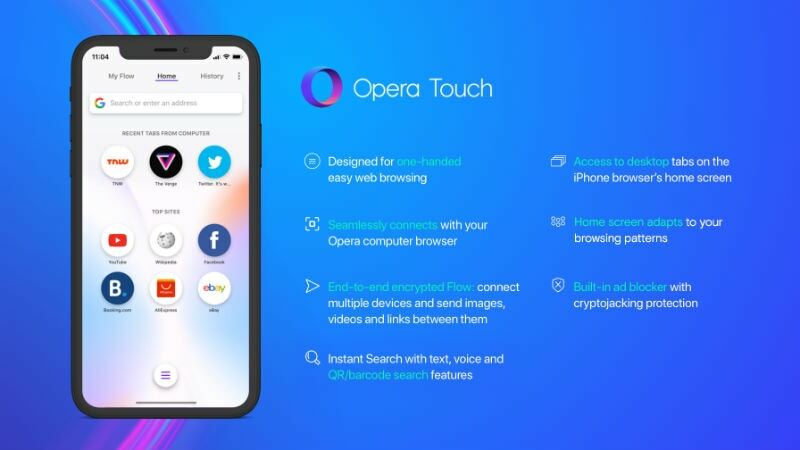 In April 2018, Operahad unveiled its latest mobile browser that can connect with the updated Opera PC browser without setting up a password or login. One of the key features of the new Opera Touch is that the navigation has been designed to be used with just one hand, making it easier for users to browse the Internet. Opera claims that the new browser comes with a “more modern” design compared to the Safari browser. Coming to the features of Opera Touch, the new browser is equipped with a built-in ad-blocker with cryptojacking protection. The browser is claimed to provide a fast access to search, as it starts directly in search mode. As mentioned, it has been designed for one-handed web browsing and comes with key browser elements at the bottom of the screen. It comes with an end-to-end encrypted Flow feature that connects multiple devices and shared images, notes, links and videos between them. Additionally, it comes with Instant Search with text and QR/ barcode search features. Users will also get access to tabs from the Opera desktop browser on the iPhone browser’s home screen. Also, Opera says that the browser “adapts to you”, meaning the top sites will automatically be added to the browser’s home screen.